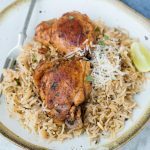 Easy and delicious Garlic Herb Chicken and rice made in the Instant Pot in 20 minutes. Healthy family-friendly dinner you can make on any day. First measure rice. Wash it until the water runs clear. Drain excess water and let it soak. Measure Stock/ water required for cooking rice and keep it warm. To Chicken, thighs add salt, pepper, chilli powder, lemon juice. Mix well. Keep aside while you are preparing other ingredients. Turn on the Instant Pot and put it in Saute Mode. When the Instant Pot is pre-heated, add Oil. Add seasoned Chicken Thighs to the pot and sear it 2-3 minutes on each side. Once they look light golden brown and crispy, remove and keep aside. Add butter to the pot, followed by chopped Onion. Saute until Onion looks soft and translucent. Add Chopped garlic and cook for another 30 seconds. Add herbs, Paprika, Chilli powder. Mix well. Drain any extra liquid and add soaked rice. Pour in warm stock or water. Season it with salt and pepper. Arrange seared Chicken thighs in a single layer. Add any extra liquid that would have come from Chicken thigh while resting. Switch Instant Pot to manual mode. Set the timer for 8 mins. And let the Instant Pot do its job. When the timer is off, let the pressure release naturally for 8-10 minutes. Then release pressure using back of a spoon manually. Once the pressure is released completely, open the lid and let it rest for another 10 minutes. Using a slotted spoon or fork separate rice grain gently. While serving sprinkle some parsley and parmesan cheese. While seasoning Chicken salt is already added and Stock also has some amount of salt. So adjust salt at the end accordingly. Adjust the amount of chilli powder as per your taste. Substitute Stock with a mix of stock and water. While you Saute, if the Pot gets heated, Off the Instant Pot for 1-2 minutes. The contained heat at the bottom should be enough to do the rest of the work. To avoid burn notification, make sure you deglaze the inner pot after adding the stock. Once you add stock, scrap the bottom of the pot to remove any stocky brown bits from the bottom. To make Chicken and Rice in the Pressure cooker, increase the amount of water to 3 cups. The steps would be the same. Once you close the lid, let the pressure build. Reduce flame after one whistle and let it be on low flame for 6-7 minutes. Switch off the flame and let the pressure release naturally.